This unique Zondervan Bible Extract offers daily readings consisting of 180 selected passages, including at least one chapter from each of the Bible's 66 books. 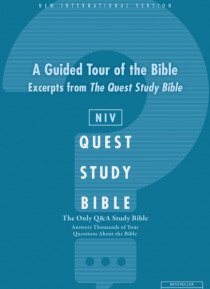 You can read both the chapter and its accompanying question-based notes that clarify the meaning of the Bible text in 15 minutes per day.With a few exceptions, the Biblical material appears in chronological order. You will read the psalms … attributed to David as you read about David's life. You will read the prophets along with their background history. Portions from the Gospels, too, are interspersed, giving a composite picture of Jesus' life on earth; Paul's letters are scattered throughout the record of Jesus' life.